Versatility is one of the largest assets we can provide our customers throughout the Americas and across multiple industries. Among our service capabilities are our revolutionizing water jet cutting services that provide uniquely-designed parts with efficient and quick turn-around delivery. We have the capability of slicing into a wide variety of materials to deliver standard and custom shapes to 5-inches thick utilizing a 6-ft. wide x 12-ft.long table. We serve a broad range of applications tailored to specific customer needs including military and defense, construction, aerospace, automotive, utilities, and machine tool, to name a few. 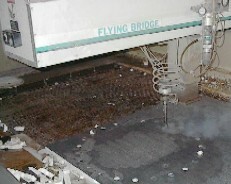 For efficiently created complex custom shapes, gaskets, flanges and strips to affordable in-house processing services like glass water jet cutting and metal cutting, call on Gardico, Inc.
We have the ability to create precision parts, shapes and contours with glass water jet cutting services that are achievable with far greater cost effectiveness than with other cutting machines. Our cutting process allows fast cuts for complex glass designs up to 4-inches thick with accuracy in each application. If you require fabricated glass parts we are equipped to handle the most intricate glass water jet cutting. Our material capabilities reach far and wide. Call on Gardico, Inc., for flawless precision cutting with our water jet system that can cut just about anything from glass, marble and tiles to a variety of metals including aluminum water jet cutting. The use of a water jet system for the majority of metal cutting may be the most solid choice as a versatile cutting method when compared with other systems in the fabrication industry. It is extremely precise and efficient in creating complex parts in shapes and designs. Since water jet machine cutting is a cold cutting process it is ideal for applications in the aerospace, automotive and medical industries where materials cannot be affected by heat.